Americans make a lot of garbage – 4.3 pounds per person per day on average, which is 59 percent more than they did in 1960, according to Duke University’s Center for Sustainability and Commerce. A number of efforts are underway locally and nationally to reduce waste, including a new push announced in September 2015 by the U.S. Department of Agriculture and the Environmental Protection Agency to get restaurants, food manufacturers and others involved in helping cut food waste in half by 2030. Making less garbage would save money, prevent pollution and conserve natural resources. It also could help the country curb emissions of methane, a byproduct of decomposition and a potent greenhouse gas that contributes to climate change. Landfills are America’s third largest source of methane, according to the federal Environmental Protection Agency (EPA). 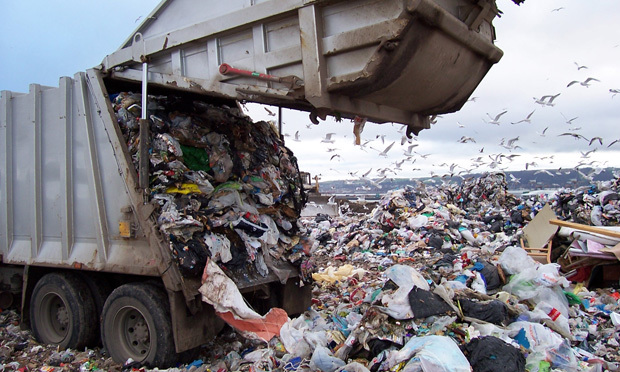 About 20 percent of methane emissions in 2014 came from municipal solid waste landfills. For decades, the EPA has collected and reported data on the generation and disposal of trash as a way to measure the success of waste-reduction and recycling programs. But three researchers from Yale University and the University of Florida have published a report in the journal Nature Climate Change indicating they have established a more accurate method for calculating how much solid waste the U.S. produces annually. For the September 2015 study, “Estimates of Solid Waste Disposal Rates and Reduction Targets for Landfill Gas Emissions,” Jon T. Powell and Julie B. Zimmerman of Yale and Timothy G. Townsend of the University of Florida analyzed operational data from more than 1,200 landfills over a number of years. In addition to waste disposal quantities, the team looked at the efficiency of landfills’ gas collection systems and the prevalence of landfill fires. The EPA’s Office of Research and Development partially funded the study. U.S. landfills disposed of a total of 262 million metric tons of municipal waste in 2012 – more than twice as much as the EPA had estimated. The EPA’s nationwide disposal estimate for 2012 was 122 million metric tons. The authors’ calculation also exceeds the amount of municipal waste that the World Bank had projected that the U.S. would have in 2025 by about 4 percent. Gas collection systems at closed landfills were significantly more efficient than those at open landfills. On average, closed landfills were 17 percentage points more efficient. However, 91 percent of all landfill methane emissions were generated at open facilities. A challenge to improving gas collection at landfills is the potential for collection methods to cause or contribute to fires. Of the 869 landfills that had active gas collection systems in 2010, 46 percent experienced at least one fire between 2004 and 2010. During this time period, about 17 percent of landfills with gas collection systems had multiple fires. U.S. landfills have a median of 34 years of available capacity remaining. Related research: A 2014 report from the U.N.’s Intergovernmental Panel on Climate Change, “Climate Change 2014: Mitigation of Climate Change,” outlines ways to limit or reverse trends in greenhouse-gas emissions. A 2013 study published in the Proceedings of the National Academy of Sciences, “Anthropogenic Emissions of Methane in the United States,” attempts to quantify methane levels and identify key sources of emissions. A 2011 study by Columbia University’s Earth Engineering Center for the American Chemistry Council, “Energy and Economic Value of Non-recycled Plastics (NRP) and Municipal Solid Wastes (MSW) that are Currently Landfilled in the Fifty States,” seeks to quantify the energy that is contained in discarded materials and its economic value. Citation: Powell, Jon T.; Townsend, Timothy G.; Zimmerman, Julie B. “Estimates of Solid Waste Disposal Rates and Reduction Targets for Landfill Gas Emissions,” Nature Climate Change, September 2015. doi: 10.1038/nclimate2804.